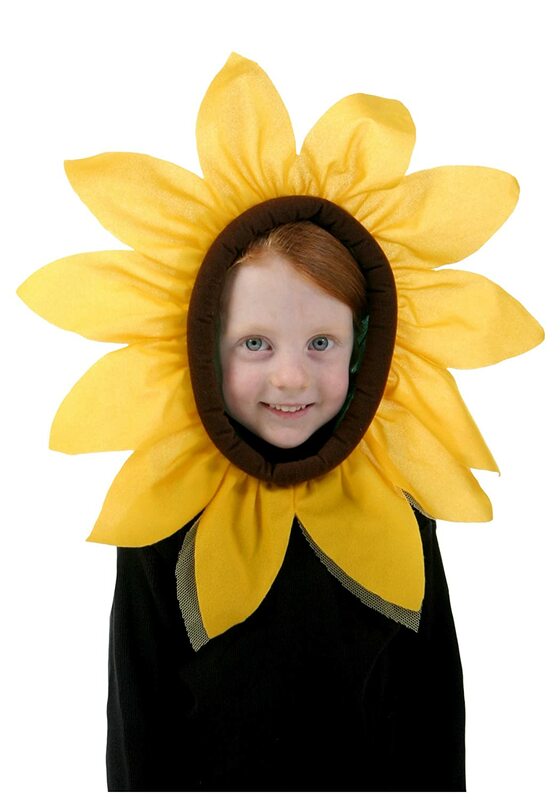 Sunflower Halloween costumes for kids make wonderfully sweet and sunny themed outfits for children of all ages. 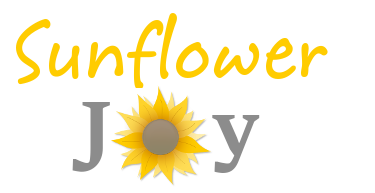 These sunflower costume designs, which you can either buy as ready made outfits or put together as separates, are also perfect to wear for children's parties, dressing up fun and just because. This page is filled with loads of cute items that are needed to achieve this sweet floral look. You can add to the costumes by choosing pretty hair accessories, matching shoes, costume jewelry and more. Young children, toddlers and babies, in particular, look truly adorable dressed up as sunflowers and with this floral theme. 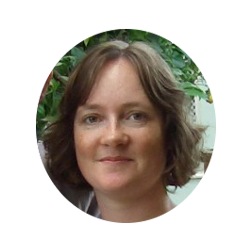 On this page, I've picked out lots of sweet ideas for a child's outfit. 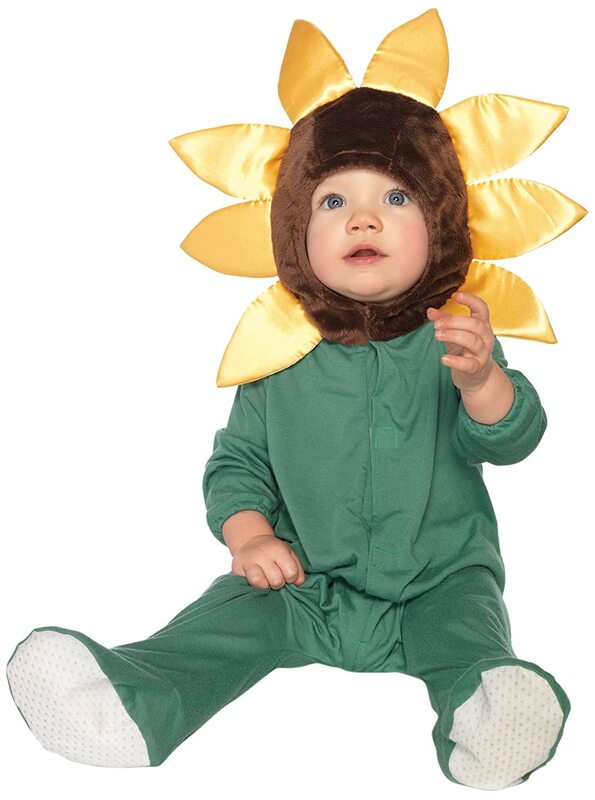 Children's sunflower costumes are such bright, sunny and summer filled designs that will help to ensure that your little one can really shine out in a crowd. Both girls and boys should look really cute in this sunny flower outfit with a jumpsuit and hood. 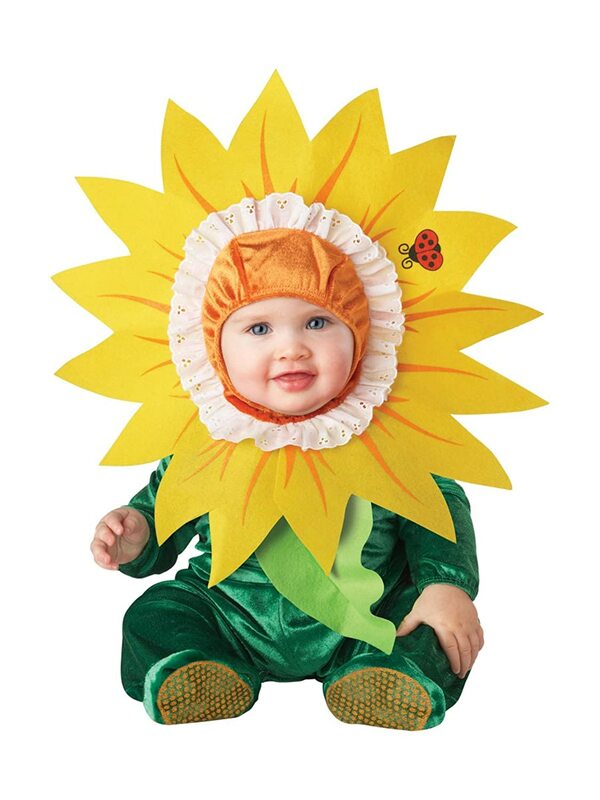 Babies look really adorable dressed up as the sunflower. This green jumpsuit comes in a choice of three different sizes. It features a bright yellow petal hood along with a green jumpsuit. It also comes with skid resistant feet and leg snaps for easy diaper changing. You'll need to make sure that you get some really good photos of it while it is being worn. Children look really sweet when all dressed up in flower themed clothing. They look just like the sweet pixies and flower fairies. 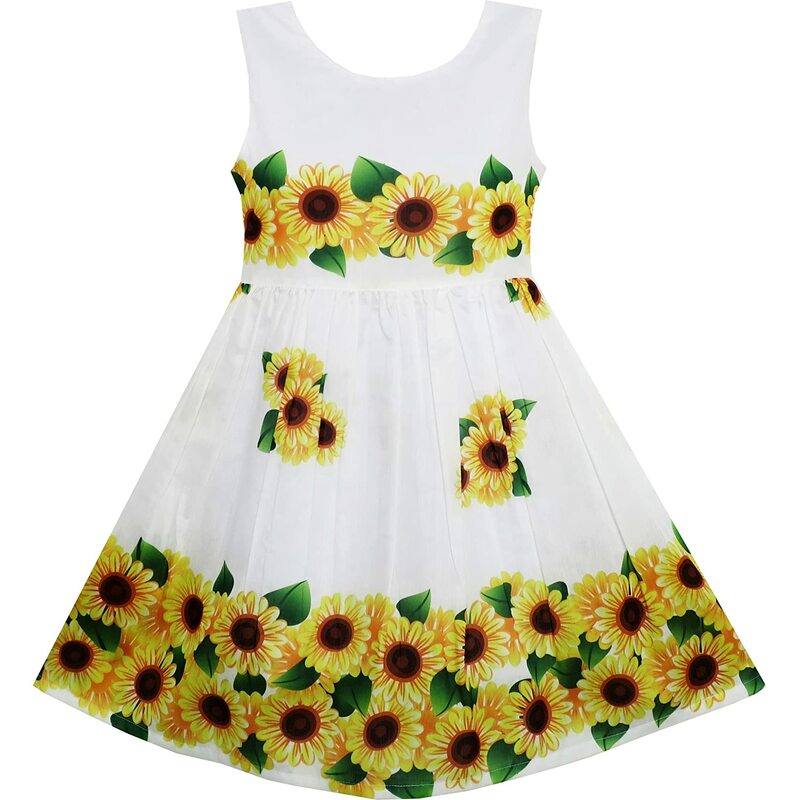 The wonderful bright yellow of this sunflower plant makes for an outfit that should ensure that your little one can really stand out and shine in a crowd. This is one of the prettiest looking floral sunflower costume designs that I have found. Any young girl ought to really love dressing up in this costume choice which should make her look just like a real pretty flower girl. Some of the tutu dresses you will find are actually based on the Iridessa fairy from Tinkerbell. It comes with the flower styled tutu dress made with yellow tulle. If you don't want to go down the flower fairy look then an alternative option is to buy a sunny yellow dress and then add on some well chosen floral accessories such as a headband and costume jewelry to get just the right look. This is a perfectly styled choice for the Fall season and Halloween with the gorgeous colors of brown, beige, orange and yellow. Babies can look really adorable by wearing just a large flower or a yellow flower headband right across their super fine head of hair. For older children, who probably have much longer and thicker hair, consider getting hold of some yellow hair scrunchies or some large bloomed hair clips. 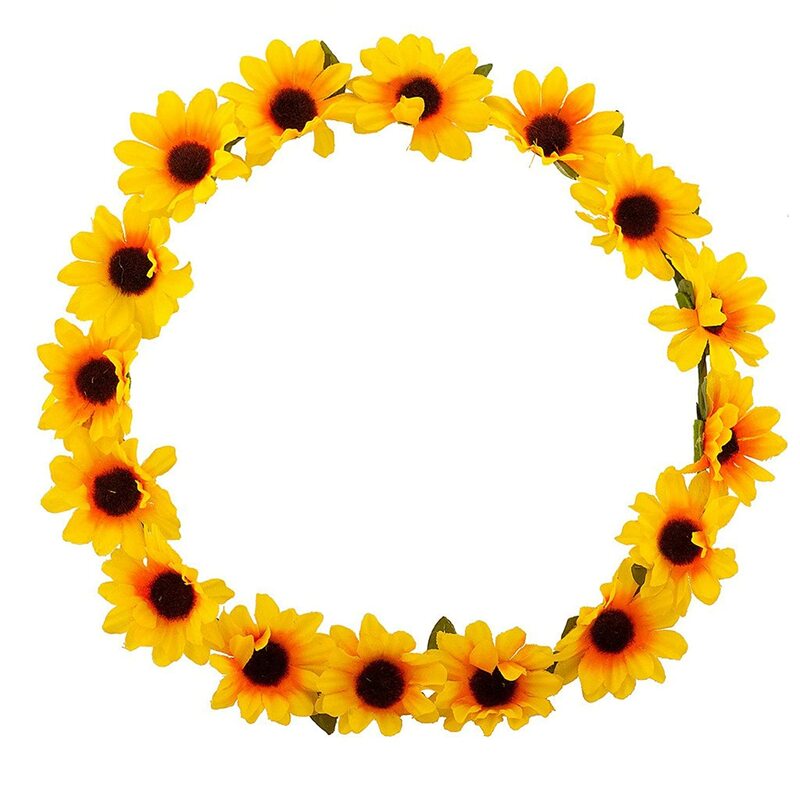 Alternatively, you could also sew or glue a fabric sunflower accessory onto a plain hair band or clip in order to get the exact look that you want. Young children and babies in particular can look really adorable wearing headbands. Why not choose one to complete the outfit. What about making a bright and breezy looking hood or headpiece. This could be designed to frame a child's face with the petals of the yellow sunflower sunshine plant. You can create a headpiece that will slide over the head and fasten at the back. Use velcro as a fastening at the child's neckline so it is easy to take on and off. Yellow petals at the front of the costume design could be made from felt. Felt pieces are easy to work with as a fabric because it does not fray and it can be glued in place. If it needs to be cleaned you can spot clean it with a damp cloth. Make a second row of petals behind the front ones with a no-sew fabric such as a thick tulle. Stuck finding some hair accessories that you really like the look of? You can buy some pre-made fabric sun flowers and use a hot glue gun to stick them down onto a plain color headband or hair clip. This would work with solid yellow, brown or black headbands. Flower themed hair clips should match in with this Halloween costume theme beautifully. Ballet flats that come in cream, gold, yellow or orange colors are an ideal choice to work with this Sunflower Halloween costume theme. Ballet flats can look even more adorable on young girls when teamed up with a full skirted tulle netting tutu. Shoes and other carefully chosen accessories such as hair accessories, jewelry, bags and make up can really make an outfit. Don't worry if your costume looks rather plain because you can transform it totally with all the extras. Babies who aren't walking yet don't need footwear. However, we always bought our daughter little ballet slippers to match up with dresses and outfits for special occasions and celebrations. We kept those as well for sweet mementos of her childhood. Toddlers can look cute wearing yellow slip on style shoes such as crocs. Older children can pick from loads of pretty looking sandals which can work well with this costume. Look for colors such as white, cream, gold, yellow and bronze. With just a small amount of imagination and the wave of a magic wand, you can transform this girl into a sunflower fairy. As long as you have a pretty dress or layered tutu skirt, you can add on some orange or yellow costume wings. A yellow or orange tutu worn with a brown top, some tights or tight fitting leggings or pants will form the base of the costume design. Then stick some fabric sunflowers over the design to make an outfit that looks very special and is magically unique for your child. This little green and yellow sunflower jumpsuit is adorable. You could customize a plain green jumpsuit with yellow felt cut into the shape of petals and glued around the hood. Any child can be turned almost instantly into a beautiful flower fairy with a pair of pretty, yellow fairy wings. A wand can also be a great accessory for this magical looking outfit too. Your little sunflower fairy girl can create some make-believe magic. There are many available dresses that feature this flower as motifs on the design or you could buy a pretty yellow pageant or party dress and add on some sunflowers to it yourself. If you are on a budget then dress up an existing outfit (white, cream, yellow, brown and black are ideal choices) with some bright and bold floral accessories. What better than a colorful and cute sunflower purse to accessorize the outfit. These purse designs can completely complement the look depending on the age of the child. With a very bold bag choice, you could perhaps get away with just a yellow dress and black leggings or pants to match. A sweet and striking coin purse really sets off the theme beautifully. You can of course bookmark or favorite this page so you can refer to it again and again as you get your sunny outfit styling just right.